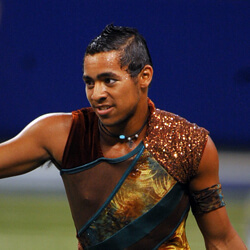 Joshua Crosby, 20 Florida State College Teal Sound Color Guard 2009-2011 What do you think is important in choosing which corps to audition for? Finding a place that feels like home and that is family oriented is what was most important for me. How do you like to prepare for an audition? It's simple. The best way to get ready for auditions is by practicing. Practice makes perfect, and the only way to get better is to practice. What was your experience like the first time you auditioned for a corps? To be honest the first time I auditioned for Teal Sound, I had no idea I was actually auditioning. My band director had asked me if I was going to the corps' color guard camp. My mom allowed me to go and I went on from there. What advice would you give to somebody who is nervous or unsure about auditioning? Don't be! Those running the audition are very supportive. I have never been in an audition environment that made me feel nervous or unsure. Just remember to breathe and always to count! Any other tips? Find a place to march with people you can call friends. See where your friends are going and see if that place is a good fit for you. Don't be afraid to call or e-mail different corps and ask questions. Learn more about corps audition dates, locations and additional info.